We were contacted by this new home buyer originally to perform a complete pool inspection. 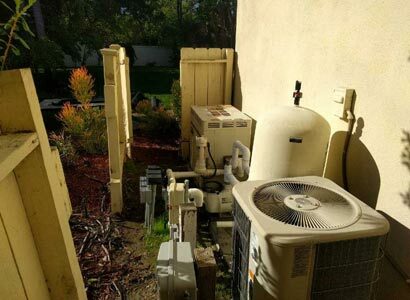 This was due to they were getting ready to close on the home purchase and they wanted a better understanding of their existing pool equipment. Once the pool inspection was complete and the new buyers moved in, they wanted a quote to install all new pool equipment. They wanted to make sure that everything was gonna to work when they wanted it to as the often entertain. They were even more interested in having the pool upgraded with new pool automation. The new pool controller would allow easier control over the swimming pool and hot tub and allow them to control everything with their smartphone or tablet. We provided them a quote for upgrading all of the pool equipment that included the pool heater, pool pump, pool filter, and switching the old electronic time clock to the new pool automation. They accepted the estimate so we started the work during the time they were also performing an internal remodel of the home. This allowed the customer to get all of the pool work done before they completed the move-in process. With the pool heater installation, we removed the old Purex Triton MiniMax NT pool heater and installed a new Raypak 406A pool heater. We installed the Raypak because we know these pool heaters are durable and hold up to time and the elements. With our many years in the field, we have seen the most success with Raypak. Not to mention, this is an atmospheric pool heater that does not use an additional blower or fan to vent the heat. A blower on a pool heater is used to exhaust the heat from the heat chamber whereas the Raypak vents naturally. Because of this, our Raypak customers will not encounter the very likely replacement of their blower. A cost that is very near a thousand dollars. 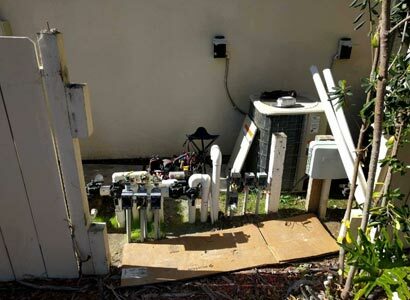 The Raypak pool heater has also not changed very much over the decades and parts are very accessible if ever there is a need to need a pool heater repair. This one was a no-brainer. We replaced the single speed Pentair WhisperFlo pool pump with a new variable speed, energy efficient pool pump installation. The pump we recommend and use most of the time is the Pentair variable speed pool pump. The Pentair variable speed pool pump is the best pool pump on the market and they have a good warranty. 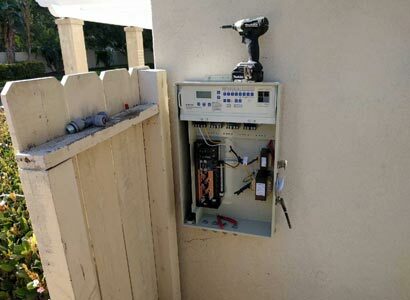 Installing a new variable speed pool pump is mandatory as it is a California state law. Any pool filter pump above a 3/4hp rated that really means a 1/2hp pool pump must be replaced with a variable speed pump. The law is the Title 20 law and as licensed pool contractors we will not perform work illegally. This type of pool pump is very efficient and will pay for itself in a very short amount of time. It also runs at a much lower speed most of the time making this pool pump extremely quiet. Whenever we install new pool automation it is usually a Pentair pool automation installation. And based on the client’s specific needs it would be the Pentair EasyTouch four or eight function or the Pentair EasyTouch lite pool automation. All of these pool controllers are the best and we recommend Pentair for most installations. We will install any type of pool automation though Pentair is our first choice. These controllers work very well, are very user-friendly, and seem to hold up the best to age and usage. With this swimming pool automation comes the ability to operate your swimming pool or hot tub with your smartphone or tablet. They also offer a wall mounted remote or a wireless home remote that is water resistant. One of the benefits of using the Pentair pool automation is the added benefit of having a saltwater pool chlorine system built into certain controllers. 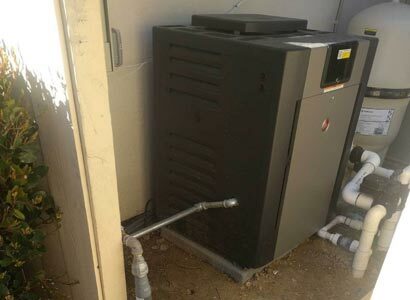 This Pentair EayTouch eight had the saltwater chlorine system built in as the Rancho Santa Fe pool owner wanted a saltwater pool. They wanted a saltwater pool because they have children and they entertain often and always wanted to be sure their pool was sanitized and looking good. Installing a saltwater pool chlorine generator is a great idea as long as your pool service technician is competent. By having a saltwater pool, there is much less need for chlorine but the acid demand is much greater. To help with the overall function with a saltwater pool system installation is to periodically add a stain preventative such as Jacks Magic Magenta Stuff and to perform the mandatory salt cell cleaning. Pentair also makes a very good pool filter. We almost always go with the Pentair Clean and Clear Plus cartridge filter whenever performing a pool filter replacement. The cartridge filter is our recommended pool filter because they operate at higher flow rates, and they are very user-friendly. Regardless if the homeowner is performing the pool filter clean or the pool service tech, it is the least effort to clean and they do not use D.E.. D. E. or diatomaceous earth used in D.E. pool filters is a carcinogen and very messy to deal with especially when performing the pool filter cleaning process. If you are in need of a pool equipment upgrade in Rancho Santa Fe or any other area of San Diego, we can help. We offer complete pool equipment repair and new pool equipment installation for all of San Diego. If you have any questions or concerns, please feel free to call us or fill out our contact form. We are always happy to help however we can.